I was a very reluctant runner to begin with. If you’d told me even three years ago that I would be running a marathon this year and going running voluntarily 5 days a week, I would have told you to shake your head. Now, I happily lace up my trainers by myself and nip out, whatever the weather. This post is the first in a series on ‘Getting Started Running’, to help you make the move from occasional jogger to runner extraordinaire. I can only share what worked for me. If you have injuries or concerns, consult with a medical professional before undertaking a training plan. What make the difference between dreading a run and needing it like I need vitamin D? (Absence of either would give me wobbly legs…) 4 things changed me from being ‘someone who runs now and then’ to becoming a ‘runner’. Sign up for a race in about 3 months time. I’m not talking an ultramarathon here, I mean a charity 5 or 10k. It will be a particular motivator if the race is for a charity that you believe in. For my first ever race, I signed up for the Wrap Up and Run 10k, which raises funds for Age UK, a charity dedicated to helping vulnerable older people. As it is something that I feel strongly about, it helped with my early training, knowing that this was about something bigger than just myself. Highminded principles aside – the idea of pulling out of something that you’ve publicly promised to do because you’re too lazy is quite a powerful motivator! Say today you can run for 2 lampposts before you’re out of breath. Maybe tomorrow it will be 2.2 lampposts. Unless you monitor it, you’ll forget how much progress you’re making. I’m very goal-oriented, so this really worked to keep me running, even if the improvement was 10 seconds more of running from one week to the next. Keep a note of your progress as you go along, either privately, or tweet us with it. We love getting tweets saying “I managed 12 minutes today, thank you for the motivation” – it makes everything worthwhile. Though I haven’t experienced it personally, I have heard very good things about the “Couch to 5/10k” app, which builds up your stamina bit by bit and keeps a record of how you’re improving. I love chatting. 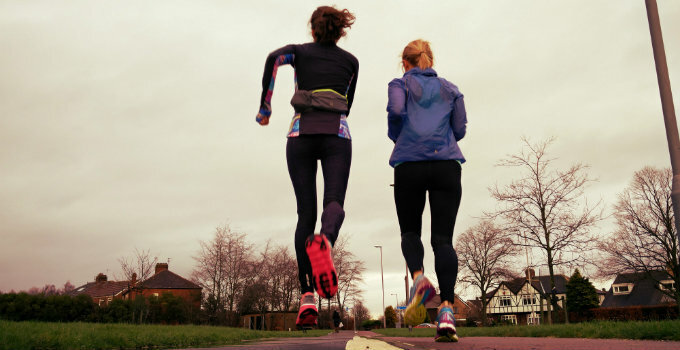 When you’re first starting out, running with someone is a good way of making sure you’re not going too fast – if you can’t chat, slow down a bit to ‘talking pace’ and you’ll build up your stamina. Running with someone is a good way of being accountable for your runs. Knowing you’ll be leaving someone on their own at 7.30 in the morning is a huge motivator in leaving the snooze button alone and getting out there. Running with someone a couple of days a week is a sure-fire way to make yourself feel more accomplished and will push you to achieve your other goals. I’m not advocating getting a dog just to run with. 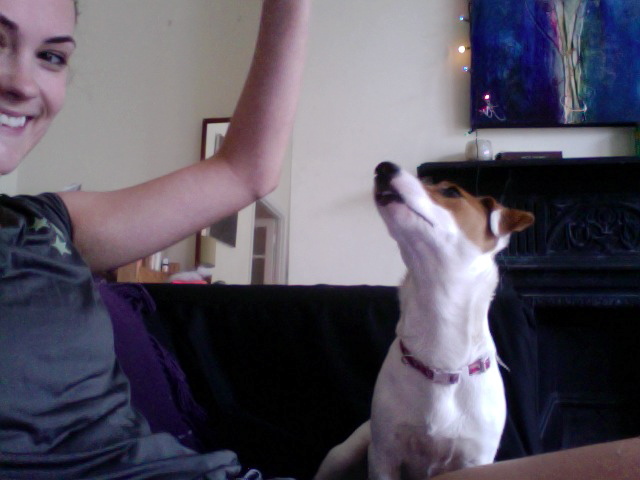 But, if you do already have a dog or have access to a dog you could borrow, I would highly recommend dog-running. 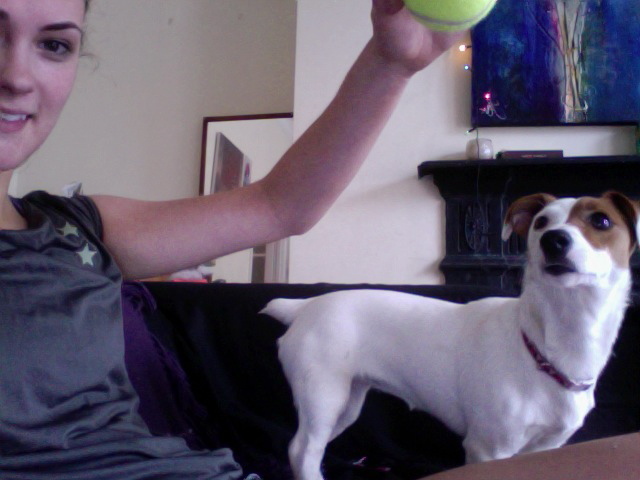 The time that I lived with Lily coincided with my falling in love with running. She had no idea that I wasn’t ‘a runner’, she was just so happy to be outside with me, even if we were half-walking and half-jog-shuffling. Borrow My Doggy is a website that puts people who have dogs in contact with those who want to walk them. What changed your mindset to feeling like ‘a runner’? Have you got any motivation tips for people just starting out on their running journey? In the rest of this series I’ll be looking at other ways to make yourself feel like a proper runner. Let me know in the comments if you have any questions on these and I’ll address them in the following posts. Keeping track of all the little improvements really helped. Seeing the weight coming off, being able to run further each week, learning to tackle a hill I’d had to walk before, and just getting a tiny bit faster got me completely hooked. The best advice I can give is to slow down! Don’t push too hard. Just relax, enjoy it, and keep going. And congratulate yourself every time because you deserve it! Even the ones where you’re not as fast, you will have done something that will help you in the future. Keep learning, and be nice to yourself. Thank you for sharing Caroline. I would definitely second “slow down”, even if that probably sounds mad when you’re very first shuffling along! But taking it that bit easier at the start will stop you getting sick-feeling and frustrated. “Be nice to yourself” – words for the ages, I think! Don’t skimp on running clothing. It’ll be more comfortable while making you look and feel like a serious runner. If I ever lack motivation I like to go out and buy myself a new shirt and I’ll have to go on a run to show it off! I’m not saying you need to go out and blow lots of money on running gear but if you ever do you will find that it is a major confidence booster! Haha, I hadn’t thought of this! I always spend lots of cash on shoes, but a bit less on clothes. That said, I always buy clothes that I like wearing, and I do find I’m more inclined to head out for a run when I have something nice and new to wear. My next post on ‘Becoming a Runner’ is on Kit – I’ll mention this theory! Hey Moe, you get quoted in my newest post on “Becoming a Runner”. You gave me a completely different viewpoint on this, thank you! Running used to be a “selfish” sport for me. I used it to sort out my thoughts for the day. I went from “a person who runs” to being “a runner” when I finished my first marathon. Ironically, though, it wasn’t completing the race that made me feel that way. I felt like a runner because it was the first time I ran with other people. The camaraderie of Team in Training–supporting each other, celebrating small and big victories together, and even crying with each other–turned me into a runner. There is absolutely nothing that beats the camaraderie and depth of feeling than that of a marathon. I can totally see what you mean – feeling part of a running community, both in real life and online, has strengthened my identity as ‘a runner’. This is fantastic. I am a “now and then runner” but I would like to be a runner extraordinaire. These steps are absolutely perfect. Now I just need to find the time… next adventure in running, jogging with the stroller! Well done on finding ANY time. I was just saying in the comments of this post – http://lifeandsole.wordpress.com/2013/06/10/exercise-tips-for-mums/comment-page-1/#comment-7 – I have so much respect for mamas getting out there with or without their babies. While in some ways working out seems like a “you-time”, it also nourishes you and gives you more to give back to your fam. The thing that completely changed my mindset was correcting my running form so that I avoided injury and running no longer felt like a chore. I would rate that as the single most important point before running, ensure you have great running form and the rest will follow. Hi Austin, I’m planning a post on Form in the ‘Becoming a Runner’ series, focussing mainly on the ‘Chi Running’ style technique. Do you follow a particular type of running style? I hate the idea of people starting running and injuring themselves right out the gate! I have read the Chi Running book and keep a copy handy. Of all the running books I’ve read it was the one that I found myself agreeing with the most. The only downside to the beginner runner is it is a dedication to learn the form and most beginners just want to get out and run. Worth it if you are willing to commit. I will be following this one… It has taken about 3 months but I feel pretty much addicted to running and exercise. At moment I can’t run cos I chased some goals a bit too quickly and got a wee injury, but am loving the thrill of cross training- today I had a crapola of a day but it all dissolved once I got all sweaty! It is pretty much torture not being able to run but I am using the time to read up on tips, day dream about pb’s and imagining how I will feel when I do my first half marathon. I am ever so slightly obsessed with your blog too, sorry about that I am kinda OK and not at all creepy stalker like. As a vegan walker and, as one aspect of that, a grounded runner, I can’t resist congratulating you and adding a few belated comments upon finding this great blog entry! Definitely regular training with goals and monitoring of progress helps. Although I’ve been doing distance walking for most of my life, only in the past few months have I learned about grounded running — a kind of bent-knee shuffle where at least one foot is always on the ground, but there’s a biomechanical running action. What I quickly found is that doing it for short intervals is really exciting. Then came a race! It was a local Fourth of July event, quite informal, put on by the Buffalo Chips Running Club — 5 miles, or just over 8K. I soon broke into my well-grounded shuffle, and noticed that some people were using a similar style and mixing it with ordinary running where they were off the ground. Shuffling alternates very nicely with racewalking technique (which uses different muscles) or plain everyday walking. But the shuffling intervals were exciting in a very special way: running and walking at the same time! Needing to follow the “contact rule” — at least one foot always in contact with the ground — makes the experience a bit different than it would be for a usual runner, but grounded running has that sense of excitement that I’d guess other runners share also. As you so neatly sum it up, regular training, meaningful progress, races or other events to add focus, and shared excitement are all ingredients. The day I “became a runner” was the day that I realized I really wanted to be a runner. For so long my self perception was that I was a person who ran but not a “runner” – real runners had lean bodies, high tech gear and ran marathons. I think training for my first 10km it struck me that if I was willing to spend several hours a week pushing myself to run farther for longer (in the rain of course), then I must love running enough to be allowed to call myself a runner. This is exactly how I was. A few years ago, I was running up to 5 miles a few times/week. One day, I decided that I wanted to run a marathon. At the beginning of that training season, I still considered myself a person who runs. After my first marathon, though, I told my teammates that some time during that training season, I went from “being somebody who runs” to “being a runner.” It was truly a transformative experience. i have a very simple theory, which has changed my mindset and attitudes towards training (from retiring at 25K to finishing almost under 4 hours in 4 years). if you are a beginner, dont try doing time and distance at the same time. on the day you promised yourself a 15K run, leave your stopwatch behind. just run, mind blank in a meditative stage, and yu will notice that you finished 15K in no time. on the day you promised yourself to run with no abandon for 1 hur straight non-stop, forget the distance. once you are comfortable with this “system”, reward yourself with a simple GPS watch to start to combine time & distance. you will surprise yourself from day 1, guaranteed. BUT dont get carried away as this leads to injury and very dragging recovering periods. learn to breath, smell your morning java, and not think about running once in a while too. This is a really good idea Prakash! We’ve foudn recently that running without a GPS watch can really make a massive difference to our mindset.